Reminder that we have a Massive Nutrition Per Dollar Study and the classic Calorie Per Dollar List. Data was collected from various stores, sizes, and brands of different Carbohydrates and Fat. Despite being bombarded with marketing, we know processed food and fast foods are expensive. Empty carbs and Jugs of Oil? Those perform well for this metric. Take note of how quickly the effectiveness drops off(nonlinear). This is a big deal, especially as something worth 2000 calories per dollar costs 4x as much as your best values. If you can beat the highest item at 8944 Calories Per Dollar, shoot me a message. The highest value by Christmas will get a copy of Efficiency Is Everything In Life. Send me an email with a photo of the price, Calories, and Servings. The first ‘edible’ food is Costco’s Rice at 4,800 Calories Per Dollar. Conclusions- Do We Implement This? If you currently are eating Pasta or Rice, you are likely averaging about 2000 Calories Per Dollar on those carbs. A 100% switch to flour(baked goods) would save you about 60 dollars a year. Not exactly worth a gigantic lifestyle change. Consider it financially healthy to make cookies, fresh bread, and other baked goods*. 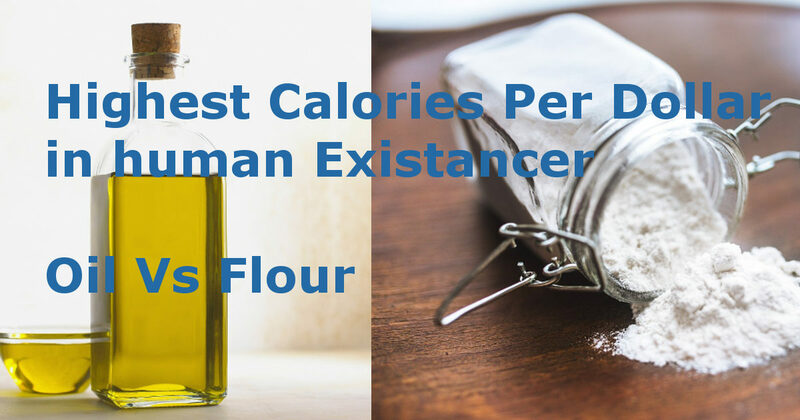 Getting all 2000 calories from Oils or Flour is a disaster waiting to happen. Lets be reasonable, a ~500 calorie goal. 25% of an average diet. A few hundred dollars a year in savings don’t seem to be worth the lifestyle. However, I can’t blame someone who wants to take the $14,000 dollars in savings over their lifetime. 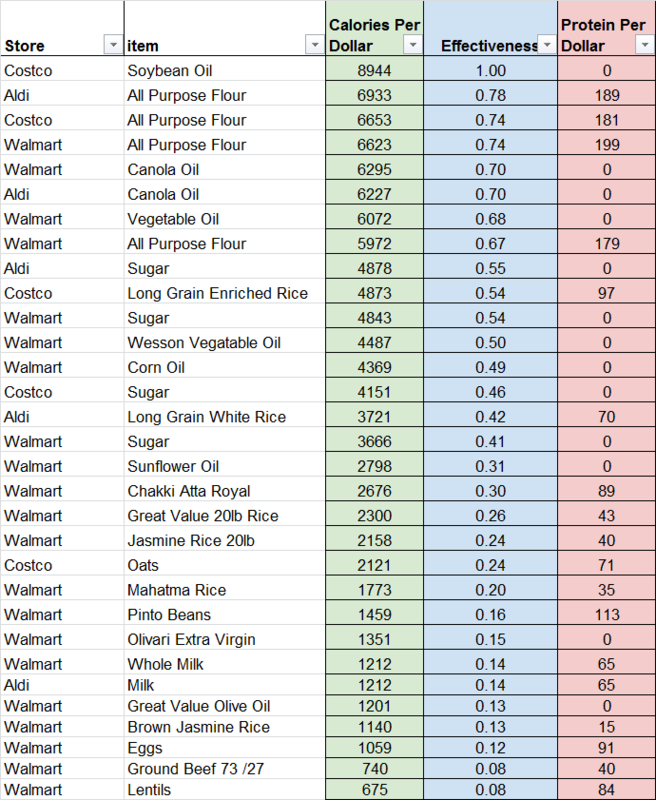 I looked through the data and found I should be buying my Rice from Costco or Aldi. The difference over Walmart hits close to home as it comes out to a very real 180$/year extra expense. I looked into Canola Oil, and their wikipedia page suggested it is decent. I am going to begin incorporating Canola Oil instead of Veg and Olive Oil when possible. I’ll be using more Canola in my life. I used to do make a similar shake when I was bulking for weight lifting. I used 2 tbsp Extra Virgin Olive Oil, 16oz milk, and 1 scoop protein. Here I suggest similar, but instead use 1 Tbsp of Corn Oil. Shake up and drink. Lunch and dinner are easy. Oils add a pleasurable mouth-feel in food. Your body is constantly looking for this long term energy storage and has developed to enjoy the smoothness of fats. You can add this to everything, Alfredo sauce, coat cooked chicken/meats, mix with a salad, mix into fried rice, heck- you can supplement fast food/restaurants by dipping your food in Oil. Try swapping or supplementing canola oil in some recipes. I don’t recommend doing this with butter, butter has flavor that is desired. Engineers collect the data and decide the best course based on ability to meet specifications, cost, and time requirements. You decide what requirements your food needs, make a decision, and optimize.